The best way to energize your body? Read my . . . Beans, Beans, Should Not Be A Musical Fruit! Please click here for recipes. Thanks for reading my blog. Melons are low in calories and high in vitamins and minerals. They are high in vitamin C, helping to provide immune support, reducing cancer and other health risks. Some melon, such as watermelon, are high in lycopene, reducing the risk of certain cancers and heart disease. Some melon, such as cantaloup, are high in potassium, an important mineral for heart health. Cantaloup may help lower blood pressure. The melon has other health benefits as well. Eat the melon rainbow. Ripe Melon is one of those foods that should be eaten right away. Store uncut melon on the countertop for a few days or keep refrigerated in a plastic bag for around five days. When storing a half melon, do not remove seeds and cover tightly with plastic. Wash thoroughly, half lengthwise, remove seeds, slice, remove rind, serve. Potatoes are a controversial vegetable. For starters, although they are a vegetable they are nutritionally classified as a starch, in the category of white bread, pasta, white rice. Like other starches, what you combine a potato with will affect how it is metabolized. The potato is best metabolized when consumed with the skin on, as are most fruits and vegetables. Did you know that in addition to potatoes being one of the ultimate comfort foods, they are also packed with more vitamin C than oranges and tomatoes? In addition to being an incredible source of vitamins and minerals, they also contain over 60 phytochemicals. Potatoes can be part of a healthy diet, however a variety of fruits and veggies is key, healthy fats, and lean proteins are needed for a healthy balanced meal. Most of the nutrition in the potato is stored under the skin, so try not to peel them unless absolutely necessary for a recipe. Potatoes are categorized as "white," as in stay away from anything white such as white rice, white bread, white flour, etc. They carry a high glycemic load, meaning that the carbohydrate digests rapidly in the body causing a spike in blood sugar similar to soda. Ugh. Grapes are not a starch, but also have a high glycemic index. Arguably there are better choices than potatoes and grapes for your baseline way of eating, but eating potatoes seasonally, especially from your CSA, can be a healthy choice as well if you are minding the portion size, leaving the skin on, carefully choosing what you will serve with, and not eating first thing in the morning. What we serve on the potato, mix with the potato, how we cook the potato, removing the skin, which meal we eat them with, can make a monster out of the potato. Potatoes will keep for up to around ten weeks, however the "newer" the potato, the higher the nutritional value. Discard soft potatoes, those with spuds, and remove any green areas. To help prevent potatoes from spoiling and sprouting, avoid sunlight and store in a cool dark place , do not refrigerate, and do not store in plastic bags. Always wash your produce in a store bought veggie wash or in a white vinegar and water solution. Do not use hand, body, or dish soap as they will leave chemical residue. Wash the potatoes even if you plan on peeling them, whole and skin on, with a veggie brush, scrubbing the surface of the skin using a circular motion. Rinse and ready to use or peel if you desire. Potatoes can be blanched for green or nicoise salad, boiled for salad or smashed/mashed, baked, broiled, grilled, steamed, fried. Please click here recipes and thank you for reading my blog. Nothing compares to a fresh picked tomato, especially when it's organic and vine ripened. Very seldom will I purchase tomatoes off season from the grocery store. There is no comparison in flavor and most are picked green and artificially ripened. I would like to mention that although green tomatoes are not as nutritious as naturally ripened red, yellow, etc., they are delicious as a side dish. Fried green tomatoes are fabulous, healthier when fried in grapeseed oil, ghee, coconut oil. The tomato offers much more than this; "It is said that there is no other known pharmacy that can cure as many things as the tomato." Not only are they therapeutic, but useful for health and beauty. Tomatoes contain vitamin C, which is concentrated in the jelly-like substance that encases the seeds, so best not to remove the seeds. Many recipes advise removing the seeds, but to conserve nutrients keep the seeds. Tomatoes contain vitamin K, which plays a key role in clotting blood and maintaining strong bones. Vitamin A helps maintain healthy skin, hair, mucous membranes, bones and teeth. They are extremely diuretic, cleanse the body, help reduce cholesterol levels, prevent infections, eliminate uric acid (gout). DO NOT REFRIGERATE unripened tomatoes. Refrigerating unripened tomatoes ruins them. For best results, store them at room temperature, stem-side down, ideally in a single layer, out of direct sunlight. Flavor development and coloration will not take place in the refrigerator, not to mention, the texture will change. They say that ripe tomatoes can keep in the refrigerator for around 4 days, and will need a day or two to sit at room temperature to restore flavor and texture, but I would not refrigerate them. If I have to consider "storing" my tomatoes, I wash, chop, and freeze in a freezer bag. The first step is always washing your produce in a store bought solution specifically formulated for produce, or use a mixture of water and white vinegar. Tomatoes can be roasted, dehydrated, braised, sautéed, added to almost any cooked or raw dish. They can be sliced, diced, quartered....there's so much. Please click here for mouth watering recipes. Thanks for reading my blog. It seems in my experience that radishes are overlooked much of the time. Can you remember being told to finish your radishes before you can leave the dinner table? It seems to be the last thing left on the crudité platter if it is included at all. The radish is usually appreciated for it’s pretty color and ease of cutting into a pretty flower. It accompanies, but is seldom, the main event. Today I am featuring the daikon radish. It IS the main event. As a member of the cruciferous vegetables, like broccoli, radishes have amazing health benefits. It is time to start paying more attention to the radish. The daikon radish offers the health benefits of a radish, but less peppery in flavor with lots of crunch. Cooked, the daikon tastes much like a turnip. Not only are they used in culinary, but medicinally as well, like all real food. The radish greens can be eaten as well of course. To keep the radish fresh, remove the greens prior to storing, wash, and wrap in a damp paper towel prior to sealing them in a container or plastic bag. They can be eaten raw, roasted, broiled, steamed, grilled, shredded, chopped, sliced. Don’t forget to eat your radishes today. Please click here for recipes. 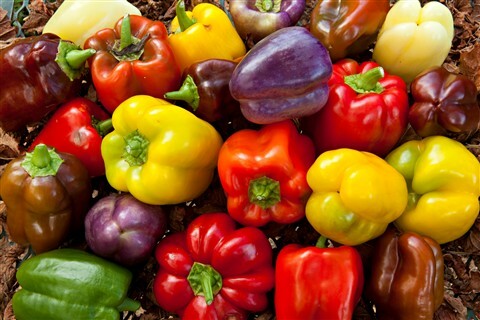 Bell peppers come in a rainbow of colors. Do you have a favorite? I prefer the flavor of orange and yellow, although purple is such a treat. Purple is also difficult to find; your best bet is to look for them at specialty markets or your local farmer's market. Did you know that yellow, orange, and red peppers all start out as green peppers? The green pepper unripened. As the pepper begins to ripen it turns yellow, and continues to ripen into orange, until it is finally the sweetest at red. If you have ever wondered why bell peppers differ in price, it's because the darker the pepper ripens, the more time it takes to grow, thus the higher price. Bell peppers are mostly made up of water. They are abundant in vitamin C, more than a medium size orange, and lots of other vitamins, minerals, protein, and several antioxidants. The more colorful the pepper, the more antioxidants, but any color bell pepper is a good bell pepper. Peppers are on the Dirty Dozen list, meaning that the residue persists even after the pepper is washed and peeled even, so it's best to buy them locally and/or organic. Pesticides are chemicals and chemicals accumulate in the body. I'll save this topic for another blog. Bell peppers are a member of the nightshade family. If you do not have an inflammatory reaction to peppers they are a food that will help reduce your health risks. Since peppers are mostly water, store them unwashed and whole in your crisper drawer where they can keep for 1-2 weeks depending on your fridge. It is said that storing on the counter will begin to shrivel the pepper, that it begins losing moisture. If you are storing a partial pepper, leave the seeds in and seal in a plastic bag with a paper towel. Thoroughly wash your bell pepper. Cut the stem by cutting around it in a circle. This should remove most of the seeds. Cut in half lengthwise or widthwise, remove any remaining seeds and if you prefer, the white "ribs." Eat raw, roasted, grilled, sauteed, stir-fried, baked, steamed. Add to salads, blend with hummus, stuff them, puree them. Please click here for recipes. I have blogged on zucchini and other summer squash and I thought I knew what they are. As I reviewed a couple of my past blogs to create this one, I began to research for any additional information to add, remove, or correct. In this case I did all three! What is the difference between zucchini, Italian squash, and courgette? Well, I believe they are the same plant and are of course considered summer squash because of the time of year they are harvested and because of their thin skin. The standard? We call the green ones zucchini and the yellow, yellow squash. I would like you to consider, if you haven't already, or maybe you know and I don't, that the green and yellow colored squash are zucchini, even if they are yellow crookneck and straightneck. And that this zucchini is called something else as well: Italian squash, courgette. And that there are more varieties of this such as golden zucchini, tatume, costata romanesco. For the purposes of this blog, I will refer to them as zucchini, because that is what I was raised knowing in an Italian family. The small to medium size zucchini are more flavorful and have less seeds. Zucchini are very low calorie, contain no fat, and are loaded with flavonoid antioxidants which greatly reduce our risk of illness and slow down the aging process, and are contained mostly in the skin. Zucchini is rich in potassium, more than a banana, which will aid in many things including blood pressure. Zucchini also contains iron, zinc, magnesium and B complex vitamins. Best to purchase local-organic, local, or organic as most zucchini varieties are genetically modified. Zucchini is best stored in the refrigerator, unwashed, in a plastic bag that has had a few holes poked in it for airflow, and then placed in the vegetable crisper drawer. It should last approximately 1 week. If you house is cool, you can usually store countertop for about the same time and in my experience maybe even longer. Overflowing in zucchini? Wash, cut into the shape/pieces you prefer, freeze in a freezer bag. Always wash your produce in a store bought veggie wash or in a white vinegar and water solution. A scrub brush should not be necessary with summer squash and will compromise the skin. Zucchini varieties can be used interchangeably in recipes. Each can be eaten raw, steamed, roasted, grilled, sauteed, etc. They can be cut in half, hollowed out and stuffed. They can be sliced, you choose the thickness, into raw "crackers." So it is virtually impossible to tire of Summer Squash. Are you in the Kale Camp? Are you tired of hearing about kale? I am giggling as I write this. I have been involved in many kale discussions and arguments. People usually love it or hate it, and most have an opinion. Why so much ado about kale? Well, aside from ornamental kale decorating gardens, it is a member of, as Dr. Axe would say, "the illustrious group of cancer fighting cruciferous vegetables." There are many types of kale, classified by leaf type. All have the nutrition and health benefits of the brassica (Cruciferous) family, and of course it's own phytonutrient that makes IT special. Kale is a natural detoxifier, a nutritional powerhouse, and anti-inflammatory. Basically kale may help reduce MANY health risks and can improve your health. Don't love kale? Maybe, or maybe you have not prepared it in a way that is palatable for you. Give some of my recipes a try. Storing: Store unwashed kale in the coldest part of the refrigerator. Kale tends to get more bitter the longer it is left at room temperature. Tightly wrap in a paper towel and then place it in an airtight bag. If you will use it the same day, place it in a water, like a bouquet of flowers, on the counter. Washing: Always wash your produce with a white vinegar and water solution or a store bought veggie liquid or spray. I use a salad spinner and soak my leaves. Preparing: I do not do this all the time, but it is recommended to tear the leaves from the middle vein. It makes for a more tender dish. Kale can be cooked any which way and added to anything, even cupcakes! For salads and side dishes, it's nice to tenderize the kale by massaging it with your hands and letting the kale marinate if you are using it in a raw salad. So chop, rip, blend, juice, roll, or leave as is. I am the designated Veggie Platter Master in my family. I can't recall the first time I was actually assigned this dish. I come from an Italian background, following the typical Italian Holiday traditions. In addition to the calendar Holidays in which I am required to create a platter, we find any excuse to gather together and celebrate: birthdays, change of season, life. There was a time when I was insulted that ALL I was assigned was this "boring" platter. Did the family elders think I did not know how to cook? Did they not like my cooking? Did nobody else want the tedious tasks of washing, scrubbing, peeling, blanching, creating, arranging? And the dip... creating a dip that would appeal to most and of course did not contain any artificial anything including dyes, emulsifiers, flavor enhancers, etc.? OK, so I am getting to the discussion of carrots, but let me just answer....No....they did not want the tedious tasks, nor did anybody approach their veggie platter quite as thoroughly as I do. My family has given me the VPM (Veggie Platter Master) title because my vegetables are extra clean, either fresh from my organic CSA (Community Supported Agriculture) when available, or from the store, organic when we are referring to the Dirty Dozen (which is more like the dirty 14 or so). At some point I became bored with carrots, but their beautiful orange color (there are also purple and yellow varieties) redeemed them. Can you list 5 orange vegetables? Digestion: Eating carrots regularly may prevent gastric ulcers and other digestive disorders. Potassium: Helps reduce blood pressure and lower your risks for heart disease. It is one of the bodies most important electrolytes. Potassium deficiency can cause muscle cramps. Dental Health: Help prevent tooth decay and kill germs. Phytonutrient: Contains falcarinol, which may reduce the risk of colon cancer. Fiber: High in soluble fiber which may reduce cholesterol. If you are tired of carrot sticks and hummus, click here for recipes. This time of year, if you have been visiting your farmers markets, you may have noticed these tangles of garlic scapes, the flower buds of garlic. These scapes are what grow from the garlic bulb when the garlic is left unharvested. Although they look really interesting displayed as a bouquet, you don't want to miss out on how delicious they are. You can eat them raw or cooked. More mild than the garlic bulb, add them to anything, whole, chopped into big or small pieces, or processed with or as pesto. Nutritional Value: Similar to the bulb, the scapes help reduce your risks of cancer and other major illness, helping to keep our organs and bones healthy. They also help the body detox, which the body needs MUCH support with even though we are detoxing every second of every day. Our bodies today are overburdened. Storage: They will keep for weeks in the fridge, unwashed, and in a plastic bag. Prep: simply wash and discard the stingy tip and any part that isn't green. Scapes are versatile; add them to anything and everything, cook any which way. For ideas, please click on the recipe button below. There are many types of lettuce. Nutritionally speaking, the more colorful or darker the leaf, the more nutritional value it has. Iceberg does not offer much besides hydration and some fiber. Romaine is an excellent choice, containing double the nutrients (including plant protein) than iceberg, and this time of the year is perfect on the grill. There are so many ways to fix a salad, I am always bewildered when I hear someone comment that they are sick of them. Lettuce is a very healthy part of the diet for most. Store wrapped in a paper towel and sealed in a plastic bag. I like to soak in a veggie wash and spin dry, first. I separate layers of lettuce with a sheet of paper towel and seal in a large ziplock baggie. Thanks for reading my blog and please click on the button below for recipes. This is such a wonderful time of year. The flowers are blooming, the grass is green, and strawberries are in season. There is nothing like a local, organic strawberry, recently picked. The picture above is not from stock, but is a photo of the organic strawberries picked fresh from Upper Pond Farm here in the Lyme-Old Lyme area. Conventional (non-organic) strawberries have been #1 on the Dirty Dozen list since the list was created several years ago, containing some of the highest amounts of pesticide residue. These pesticides and chemicals are also found systemically (can't be washed off). Industrial farmed organic strawberries are not much better. Buy your strawberries local, organic local when available. Click here for information on the Dirty Dozen. Strawberries are high in vitamin C. They also contain large amounts of folate (B9), manganese, potassium, iodine, and fiber. Strawberries have high amounts of antioxidants and phytonutrients and are considered one of the best foods to eat. Antioxidants keep the free radicals in check. Free radicals cause cell damage; we NEED healthy cells. Strawberries help lower blood pressure, stabilize blood sugar, and reduce your cancer risks. This berry is considered a Superfood. Strawberries are delicate and perishable. They are best stored uncovered on your countertop and consumed within 24-hours, or stored in your refrigerator in a sealed container, preferably in the fruit drawer, for up to two days. Store them unwashed with stem on and remove any moldy, wet, or damaged strawberries. Longer than two days, strawberries begin to lose vitamin C and antioxidants quickly, the reason we are supposed to eat them! Strawberries should be washed, dried as best you can, and frozen if not consumed within two days. Preparing strawberries is very simple. Hull your strawberries with a knife, straw, or strawberry huller. As with all produce, wash thoroughly. I soak my produce in a solution of white vinegar and water, or use a store-bought produce wash. Remember to rinse well. Please click on the button below for recipes. Microgreens are a vegetable green. They are smaller than baby greens, bigger than sprouts, and have about 40% more in nutrients than their full grown counterparts. 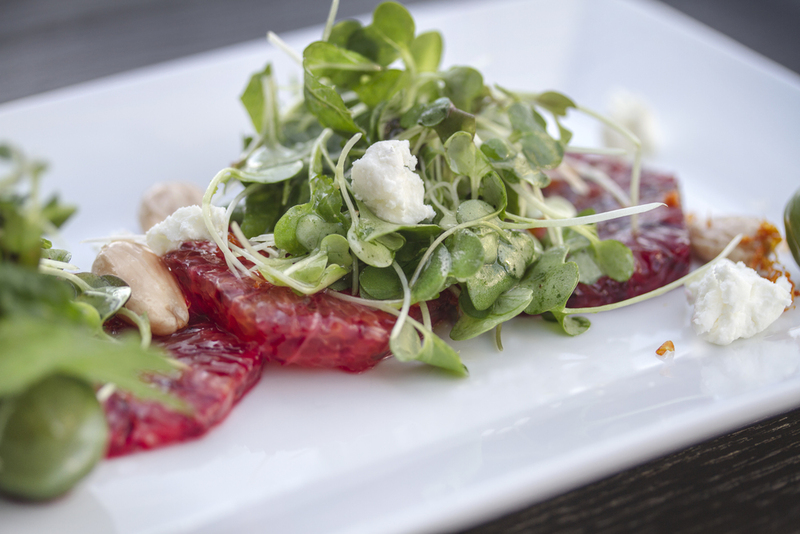 Microgreens pack big flavor from mild to spicy. You can add them to just about anything and you will instantly improve the nutrition of what you are eating. Microgreens are considered a "superfood," a real superfood that I am not marketing here for any other gain except that you should try them. Each microgreen plant tastes different, so find the one(s) you like. I LOVE them ALL! Wrap unwashed in a damp paper towel, sealed in a plastic bag or glass container. Should keep in the fridge for about a week or more. Always wash your produce with a store-bought veggie wash or a solution of water and white vinegar. That's it. You are good to go! Best eaten raw, add them to everything. Not only are you increasing the nutritional density of your meal, you are making a work of art. I like them atop my avocado toast, on my grilled panini, sprinkled on my plate as an edible garnish. I like a salad of micros with chopped red onion, artichoke hearts, cucumber, radish, olives, feta, capers. Please click the button below for recipe ideas and thanks so much for reading my blog. I think you know what to do with them, but please click below for more ideas and thanks for reading my blog. I am Italian American. Italian is the diet and lifestyle I grew up with. Pasta was served at every meal as a side dish or the main dish. A cold, stuffed shell for breakfast was quite filling. I had never heard of the spaghetti squash until a decade or so ago. Prior to my nutrition education, I jumped on the low carb/no pasta craze and purchased this squash to replace my semolina. Spaghetti squash with marinara was so delicious; it's still amazing!!! 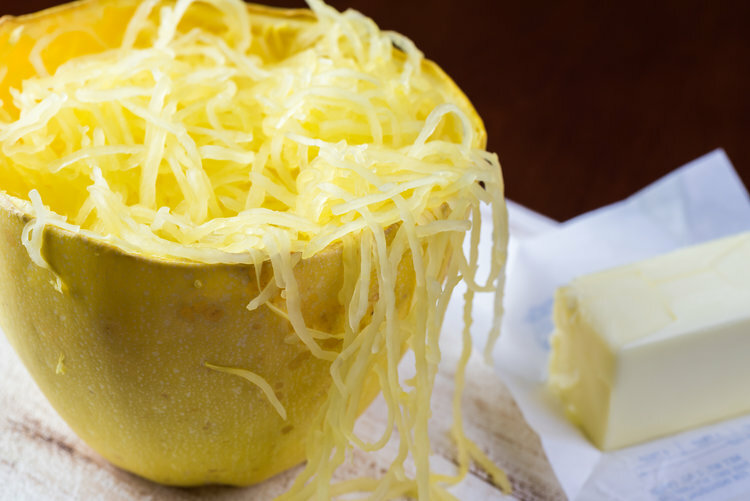 But spaghetti squash is better than a replacement; it's versatile, yummy, and a nutrition superstar. Spaghetti squash, also known as spaghetti or vegetable noodle, is originally from China. It was introduced into the U.S. in the 1920's and gained popularity in the late 20th century. This squash boasts 400% of the daily value for Vitamin A, 50% daily value for Vitamin C, contains B Vitamins, Riboflavin, Niacin, Thiamin, Folate, Omegas 3 & 6, and Potassium. Spaghetti squash is a healthy part of your diet. Eat the rainbow! Store at room temperature for several weeks. Spaghetti squash can be eaten raw, but I do not recomend it. It is not as flavorful and is chunky instead of stringy. Follow the steps below, minus the baking. There are several ways to prepare this squash and I have personally tried them all. Wash the outside of the squash. Cut the squash lengthwise. Cutting through it can be tricky if you do not have a big, sharp knife. How's that for technical!! Scrape out the seeds using a spoon but don't discard! Rinse the seeds and toss with olive oil, salt and pepper, and any other spice blend you enjoy such as curry, rosemary, etc. Bake in a 350 degree oven until fragrant and toasted. Bake the squash cut-side down on an ungreased cookie sheet in a preheated 375 degree oven until fork-tender, about 30-40 minutes. Bake time varies depending on the size of the squash and your oven of course. Using a fork, scrape out the squash and serve with a little butter or your favorite topping. Try crispy sauteed sage and butter or a fresh marinara. You can add to salads, soups, wraps, or feature it as the main meal. For serving suggestions, please click on the recipe button below. There are many types of lettuce. Nutritionally speaking, the more colorful or darker the leaf, the more nutritional value it has. Iceberg does not offer much besides hydration and some fiber. Romaine is an excellent choice. Radishes. A sign of spring. Easter Egg radishes. Full of flavor, a burst of color, crunchy, delicious, and yes...nutritious. 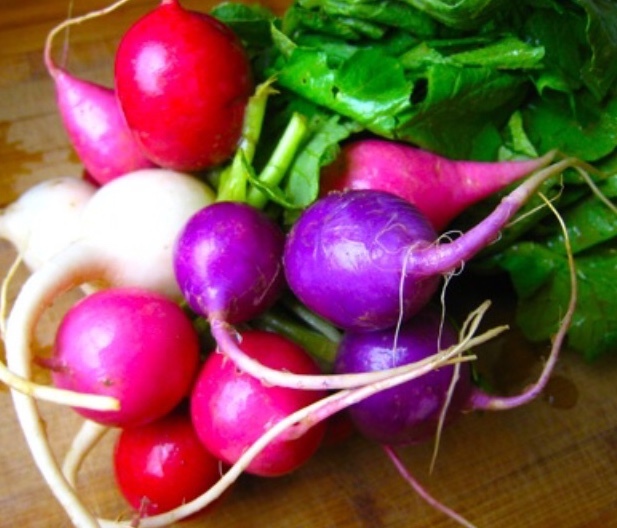 Radishes are a root vegetable, a member of the brassica (cruciferous) family, like broccoli and cabbage. The greens should be removed from the root prior to storing, prolonging the life of each. Store the bulbs covered with a damp paper towel in an airtight container in the refrigerator. covered with a Wrap the bulb wrapped in a damp paper towel and sealed in a plastic bag for around a week or two. The greens will only keep for a few days, wrapped in a paper towel and sealed in a plastic bag in the refrigerator. Scrub the outside of the bulbs with a veggie wash and scrub gently with a vegetable brush. Add to salads, serve as an appetizer, steamed, sauteed, stir-fried, roasted. The greens can be washed in a salad spinner with veggie wash and spun. Add greens to soups, saute, stirfry, eggs, or mixed with your green salad. Thank you for reading my blog and please click on the recipe button below.